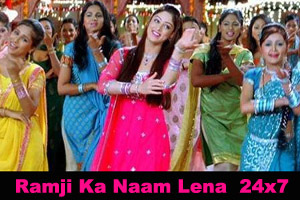 Lyrics Of Ramji Ka Naam Lena 24x7 From Movie - Isi Life Mein (2010): A playful song sung by Kavita Seth, Shreya Ghoshal, Debojit Saha featuting Sandeepa Dhar, Veebha Anand. The video of this song is available on youtube at the official channel Rajshri. This video is of 4 minutes 26 seconds duration. Lyrics of "Ramji Ka Naam Lena 24x7""
Lyrics in Hindi (Unicode) of "राम जी का नाम लेना ट्वेंटी फॉर सेवन"